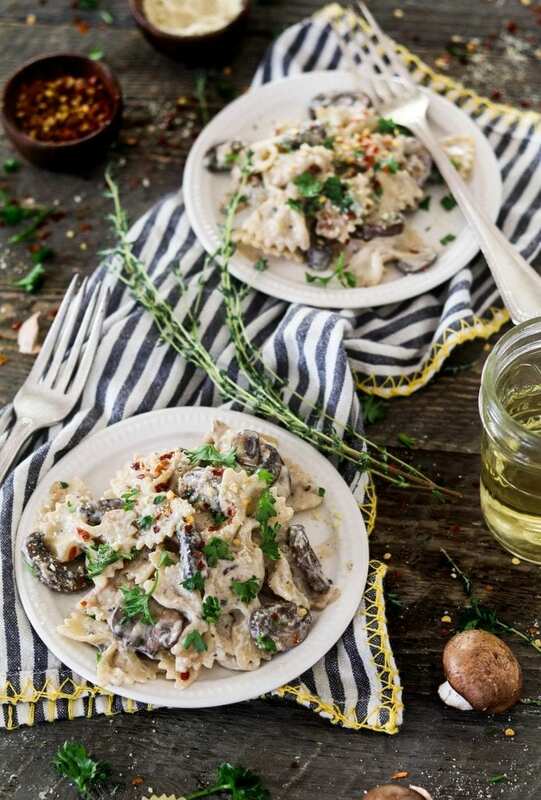 This Vegan Mushroom Stroganoff is savory, comforting and oh-so-creamy! It’s nut-free and much healthier than its non-vegan counterpart. 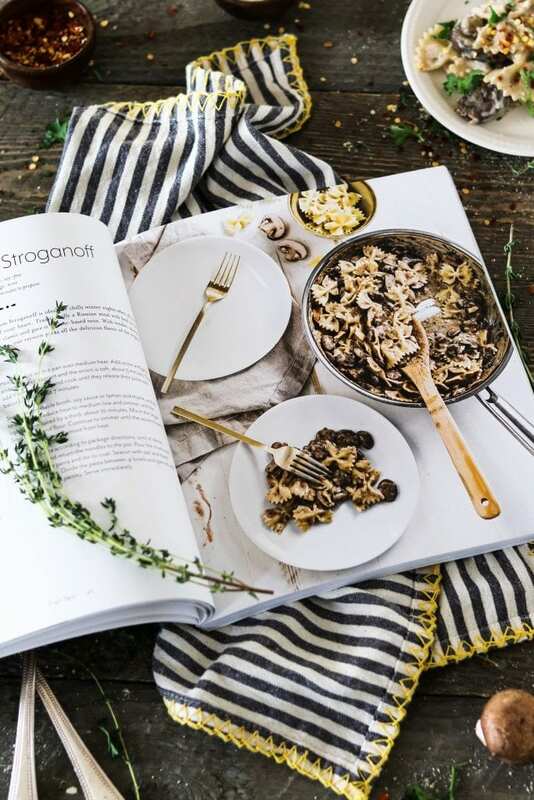 I have another fantastic cookbook to tell you about today and this Vegan Mushroom Stroganoff is right out of its pages. Yep, I have permission to share it right here on Vegan Huggs. You might be familiar with Katie Koteen and Kate Kasbee. They are two cross-country friends that share tons of simply delicious, and healthy vegan recipes on their blog Well Vegan. Well, now they are sharing even more deliciousness in their new cookbook Frugal Vegan. This cookbook is designed to show you that tasty vegan cooking is easy, affordable and fun! 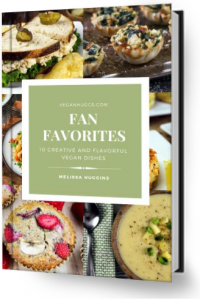 Whether you’re a vegan, vegan-curious or a carnivore, this cookbook is for everyone! The recipes inside are familiar, simple, tasty and satisfying. You won’t be going hungry, that’s for sure! 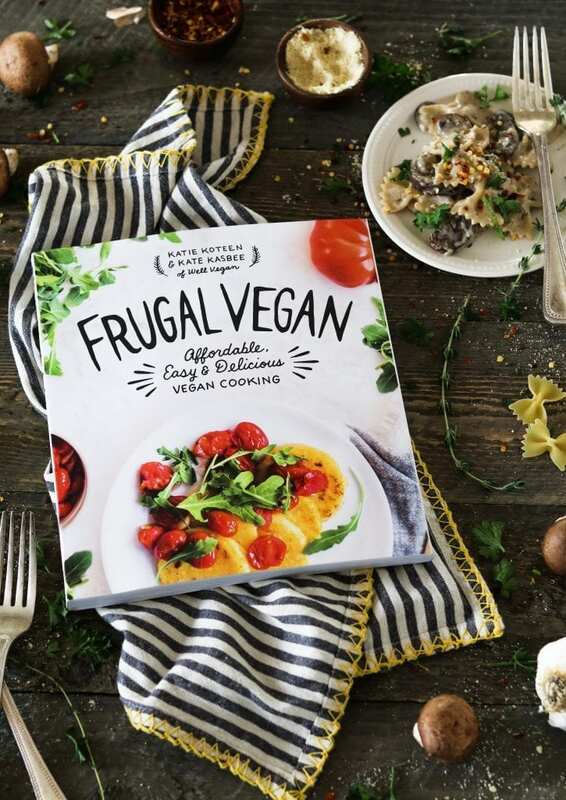 The title Frugal Vegan really lives up to its name. Each recipe was created with saving money in mind. The ingredients are easy to find and inexpensive too. It really proves that you can eat deliciously healthy vegan food on a budget. However, you’ll really be getting bang for your buck. These recipes aren’t for rabbits and there are 99 of them that are completely drool-worthy! Inside, you’ll find a smart shopping guide and plenty of tips on how to save money, including building a budget pantry. The authors also go into detail on how to batch cook and freeze your food. I’ve picked up so many new ideas and I’m looking forward to putting them into action and saving money. Who doesn’t love to save money? Also, each recipe is clearly marked with symbols that offer clarity on dietary restrictions, which include: gluten-free, nut-free and soy-free. This is definitely a safe book to buy if you have nut allergies. Almost every recipe is nut-free (except a few). A lot of vegan recipes call for nuts and that makes it hard for some people. Plus, nuts can be expensive, so omitting them is a nice bonus too. You don’t have to be a chef to make these recipes. They are easy to follow, contain simple ingredients and most of them take less than 30 minutes to make. Oh, I forgot about the photos (my favorite part). They are just gorgeous and inviting to look at. Each one gives you a feeling like “hey, I can make that” and they are completely simple & approachable. A few recipes I’ve made so far were the BBQ Chickpea Sliders, Vegan Taco Salad, and this Vegan Mushroom Stroganoff. Each dish was easy to make and full of savory flavor. I’m so excited to dive into more of this book! Do you guys notice a little trend here? I’ve posted a lot of pasta recipes lately. Gosh, I can’t help it! I’m a total carb lover and this Vegan Mushroom Stroganoff just had to be eaten. It was seriously calling my name and it was love at first sight! Usually, I skip creamier sauces during the warmer months, but this recipe is much lighter than your average stroganoff base. Many creamy vegan recipes call for cashew (even my own recipe) but this one just uses store-bought vegan sour cream. Tofutti and Wayfare brand are both nut-free (You can also use my Vegan Sour Cream Recipe if you don’t need a nut-free version). Not only is this dish lighter, but it’s also more affordable and easier to make. I really like that! But, just because it’s lighter, doesn’t mean it’s lacking in taste. It’s packed with meaty, umami-rich mushroom flavor with an ultra creamy, savory, and slightly tangy base. And all that goodness is taken over the edge by smothering your favorite pasta with it. Now that’s comfort on a plate if you ask me! Doesn’t that sound satisfying and easy to make? It’s a total weeknight winner (or weekend) and it’s totally calling your name! 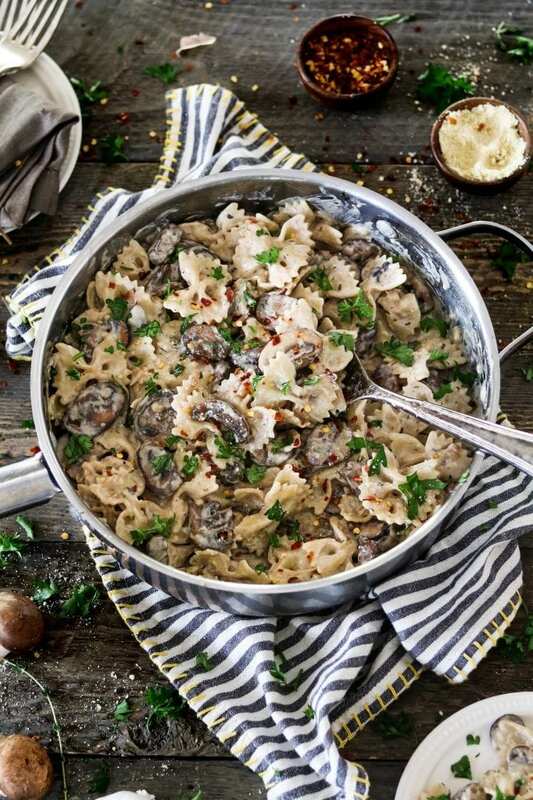 If you make this Vegan Mushroom Stroganoff,I’d love to hear what you think in the comment section below. It would really make my day. You can also follow me on Instagram and share your creation with me. Just tag me @veganhuggs and hashtag #veganhuggs so I don’t miss it. 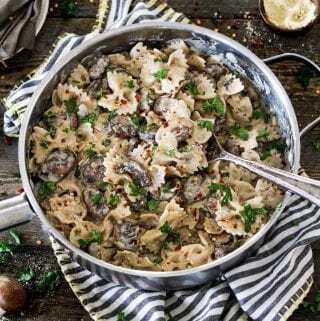 The very definition of comfort food, this Mushroom Stroganoff is ideal for chilly winter nights when all you want is a big bowl of carbs to warm the cockles of your heart. Traditionally a Russian meal with beef in the starring role, we updated this nineteenth-century classic and gave it a plant-based twist. With tender, sautéed portobello mushrooms and a dairy-free cream sauce, our version packs all the delicious flavor of the original dish without the sky-high calorie count. From Frugal Vegan by Katie Koteen and Kate Kasbee, Page Street Publishing Co. 2017. Heat the olive oil in a pan over medium heat. Add onion and garlic and cook until fragrant and the onion is soft, about 5 minutes. Then add the mushrooms and cook until they release their juices and become soft, about 7 minutes. Stir in the vegetable broth, soy sauce or tamari and thyme, and stir to combine. Reduce heat to medium-low and simmer until the liquid has reduced by a third, about 10 minutes. Mix in the Vegan Sour Cream and flour. Continue to simmer until the sauce thickens, another 3 minutes. Remove from heat. Cook the pasta according to package directions, until al dente. Drain, rinse and return the noodles to the pot. Pour the mushroom sauce over the pasta and stir to coat. Season with salt and black pepper to taste. Divide the pasta between 4 bowls and garnish with freshly chopped parsley. Serve immediately. I used low sodium tamari sauce and I added 1 1/2 teaspoons more. Taste the sauce before adding the pasta and add more tamari or salt as needed. I used 12 oz of pasta. I stirred in 2 tablespoons of lemon juice to the sauce after removing from the heat. It adds a subtle zing. Try with 1 tablespoon first and taste, add more if desired. If you use my Vegan Sour Cream recipe, it will not be a nut-free recipe anymore. Do you think almond flour would make a good substitute for whole wheat flour to make this dish low carb? Excellent! I overdid the mushrooms and I used veggie broth instead of olive oil to broth fry the onions and garlic. Served over brown rice. Amazingly good! I made this for the second time today and it came out just as good as the first time! I use vegan worchestire instead of soy sauce since my son is gluten free, and also use brown rice flour in place of regular flour. This is so tasty and I love that it gets a ton of mushrooms in for the day. Can’t wait to make this again!! I love this recipe for my vegan family. I add a package of prepackaged seitan to the mushrooms. Yummmmm! Thanks for sharing this affordable quick comfort food. Delicious! I usedbragg liquid aminos instead. Thanks for creating this wonderful recipe. OH my goodness! I made this for my non vegan family and friends and they absolutely flipped!!! Everyone loved it so so much! This was so delicious!!!! The only change I made was I added a teaspoon of vegan Worcestershire sauce and used button mushrooms! This will definitely be going into my dinner rotation! Hi, Can i freeze this if i batch cook it?